Our list of machinery covers Swiss CNC, Mill Turning, Grinding, Washing and Inspection Systems. Our plant list is shown below, separated into these categories. The capability, flexibility and capacity of our CNC sliding head machinery ensures Stag can offer superior precision components to suit almost all needs. Stag’s engineering facilities incorporate 14 Star Micronics Swiss Turning Centres manufacturing complex and simple parts for a range of industries and clients. Star Sliding head turning centres provide us machine tools with up to 13-axis machining, with C-axis on main & sub-spindles. Additionally, the machines can accommodate an impressive 80 cutting tools, with up to 14 driven tools and high-pressure coolant up to 3000psi. These innovative machines enable our engineers to manufacture simple or highly complex components in small, medium or large-scale production batch runs. The quality of our CNC Sliding Head section is complemented by our fixed head CNC mill/turn centres, that offer customers parts being machined on the most rigid, robust and accurate turning centres the machine tool industry has available. We have invested heavily in three Miyano ABX 64th machines. Optimising a one hit process, these high specification CNC mill/turn centres incorporate two spindles for simultaneous front and back end working, three tooling turrets with 72 tool stations, with up to 36 driven tool stations, plus 15kw spindles and 40 Nm power tools for maximum material removal rates. Built upon the most robust base, with remarkable thermal stability, high quality surface finishes are a given. The rigid machine tool design also delivers exceptional accuracy levels that are qualified with on-machine touch probing. Mecwash Duo Aqueous washing machine with Aquasave solution cleaning system filtering down to 15-micron contamination levels. 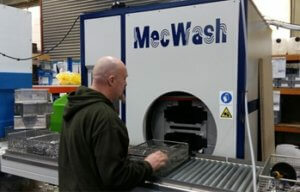 Click here for more information on Mecwash at STAG. Plus, digital hand gauges, plain plug, screw plug and thread measuring gauges.